How Good are the Giants? I am borrowing heavily from today’s post on ExtraBaggs by Carl Seward because it expresses so much of what makes the Giants hard to evaluate. There’s that old Bill Parcell’s quote: “You are whatever your record says you are,” and, well, that means the Giants are a 21-16/1st place team. But consider this: the Giants are in first place, but their offense is dead last in the NL. They are five games over .500 but are going back on the road even though they have played the least amount of home games of any team in MLB this year. I am most definitely in the camp that believes that win-loss records are the worst way to evaluate how good a pitcher is, but it is somewhat alarming to see a first place team with only one starting pitcher carrying a positive record (that would be Matt Cain of all people at 3-2). Most difficult to analyze is this: the Giants are 12-3 in one run games. Even last year, with all the torture, they went 28-24 in one run games. An .800 winning percentage in one run games is the definition of unsustainable. Final score of the home stand: Giants 18, Opponents 10. As I mentioned in the weekly rundown, because of all the close games it is hard to feel like the Giants are a great team. It is also hard to believe a team is great when one facet of the team is the worst in the entire league. And yet, they just keep winning games. Which I have no problem with! Here are a couple of thoughts: one, the Giants can’t keep winning like this. Two, that said, the offense will get better. No way this team finishes below the Padres and others in offense. Huff may not repeat his 2010 but he won’t hit .215 all year. Posey will get hot. Even Tejada is bound to do something at some point. They just got Torres back, Ross is rounding in to form, the Panda will return…this team will score more runs. Three, what continues to get lost in the shuffle (unbelievably) is that the Giants pitching is not just good, it is historically great. So far this season: 8.5 K/9; 3.15 ERA; 1.24 ERA+; 1.20 WHIP. If those ratios hold, they will actually surpass their pitching performances from the last two years. That is a) phenomenal, and b) a GREAT sign for the Giants chances to repeat. We will have to see if they can sustain this over the course of the season but there is nothing from the last two seasons of work that indicates a major regression. Most importantly, I think there is a question that hangs over a team trying to repeat: can we find the magic again? Starting the season 12-3 in one run games give the Giants a confidence that whatever mojo they had last year is still there. And we like to call that “mojo” pitching. Last, but not least, I am no Nate Schierholtz-should-be-starting fanatic but this play is amazing. 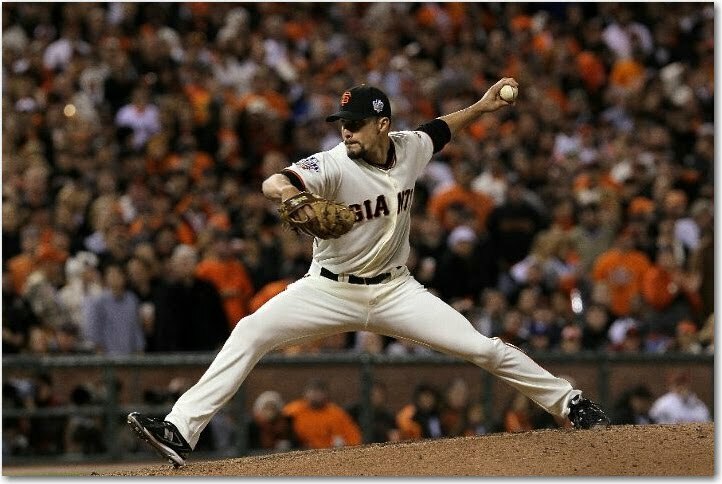 This entry was posted in Giants and tagged giants, pitching. Bookmark the permalink. Great post. It’s as I’ve been saying for a number of years now, when you have historically great pitching, you can even win with league bad hitting (though worse in the NL is usually not a winning combo, so I agree that this can’t continue). And I agree that the hitting will improve. And it has for some. Baseball Forecaster’s toolkit notes the problem of bad starts masking the return to normal production, and that confirmed what I had been seeing previously. Huff has actually started hitting well, sure SSS, but it’s a start: since May 3rd, .300/.364/.633/.997 with 2 HR in 30 AB (though still 9 K’s). If you look at his month of May, .250/.325/.528/.853, showing a big jump in ISO from his poor April. Nate Schierholtz has just been hitting for a while as well, and Cody Ross has been hitting lately. And, of course, Andres Torres has been hitting well since returning too. Which is good because both Burrell and Rowand cooled off greatly and are both probably looking at some extended bench time soon if they don’t heat up again (Rowand has actually been cold for a month now). Right now, I think that there are three keys to their ability to win tight games this season. First is their stellar rotation. Second has been their shutdown bullpen. Third, is their bullet off the bench, Darrun Ford. How many squeakers have we won with him running already? Now, I don’t expect that to continue, once Sandoval is back, Ford is gone. But building up to 9 games over .500, they could just play .500 the rest of the way, as most teams tend to do eventually, still have a stellar record in one run games, say 30-20 this season. That would go long way to making playoffs again and gain chance to defend title. I think the real key, though, to get this offense started is Buster Posey hitting. Having our #4 hitter scuffling at .244/.336/.361/.697 is throttling our offense as much as anything else. And he hit well in the middle of April, then has been totally cold for 3 weeks now. Forgot to also note, extra preponderance of road games dampens overall record – even best teams are roughly .500 on road – so leading with so many home games to make up the difference bodes well for the Giants to repeat as NL West Division winners. this is an excellent point too. Ever since they got “the freak” they’ve been awesome. Too bad about Barry though.